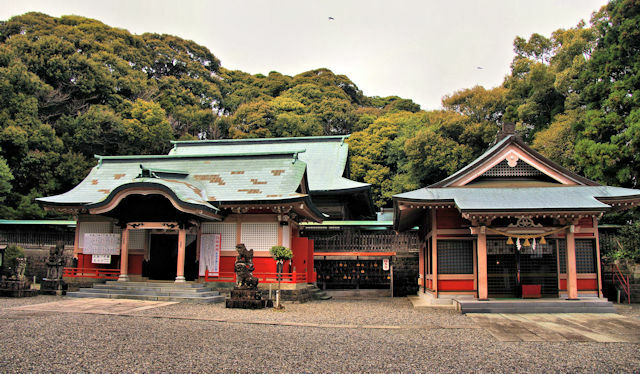 Imayama, a small hill not far from Nobeoka Station is home to the main shrine of the area, Imayama hachimangu. 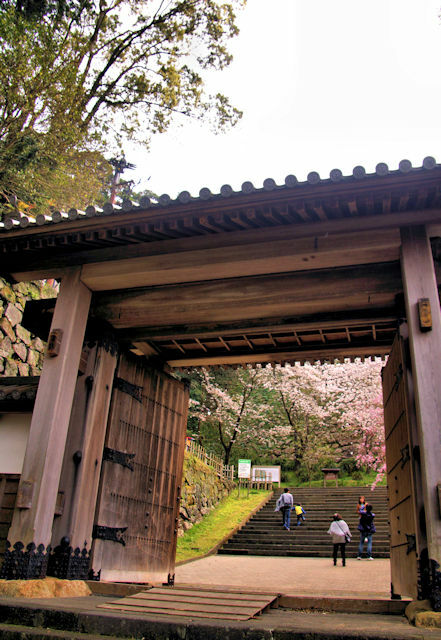 A large entrance gate that probably held Nio before the Meiji Period is at the base of the hill. 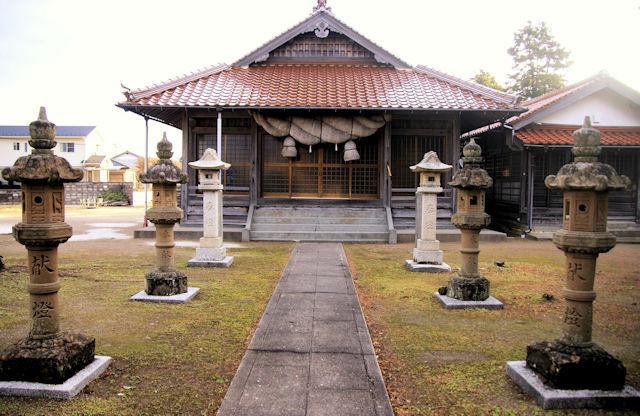 Next to the main gate was a small Inari shrine. 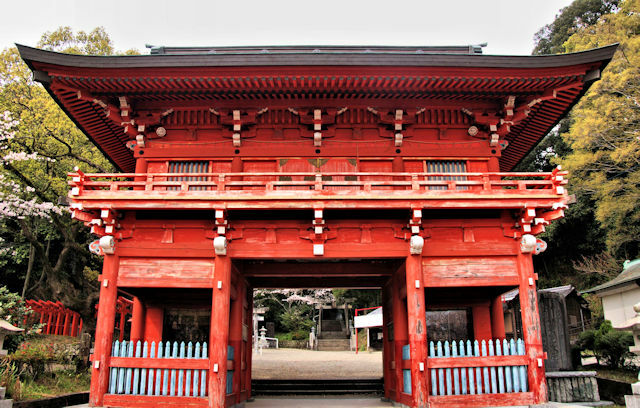 Being a Hachimangu, the main kami enshrined here is Hachiman, which is the legendary emperor knwn as Ojin, though here named by his "given" name of Homuda Wake, plus usually his mother Jingu and his wife. 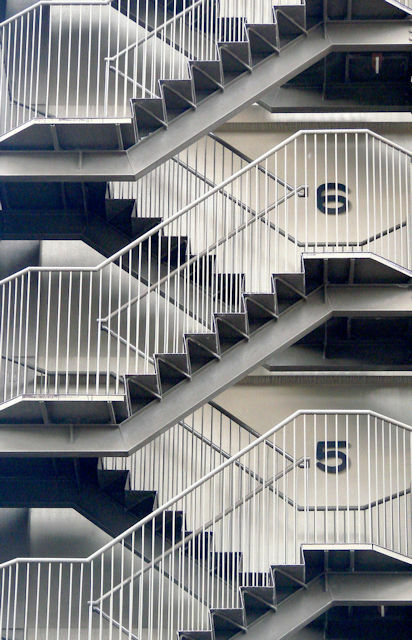 The buildings are of post-war vintage and made of concrete. 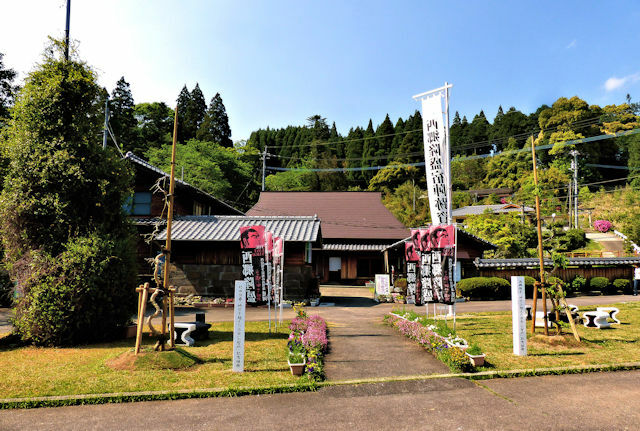 On the third day of my walk along the Iwami Kannon Pilgrimage I started the day at Shizuma with a visit to the main shrine in the village. 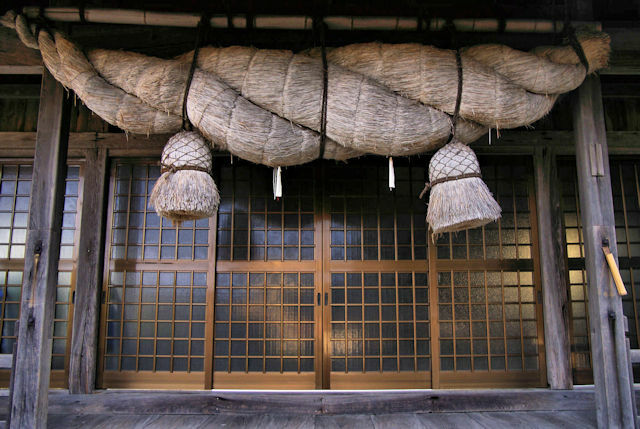 To all outward appearances just a small village shrine, with a large shimenawa in Izumo style. 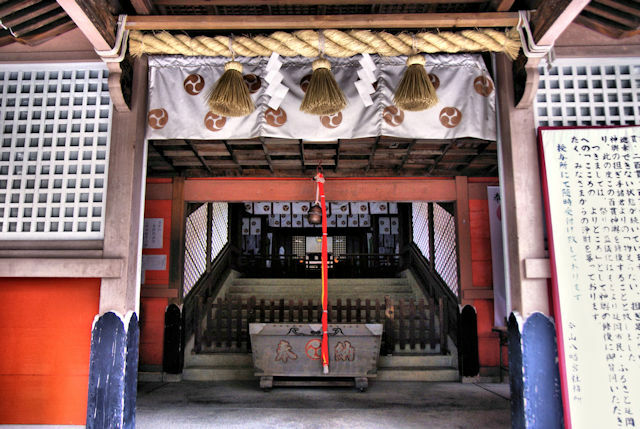 However this was a relatively important shrine in the past. 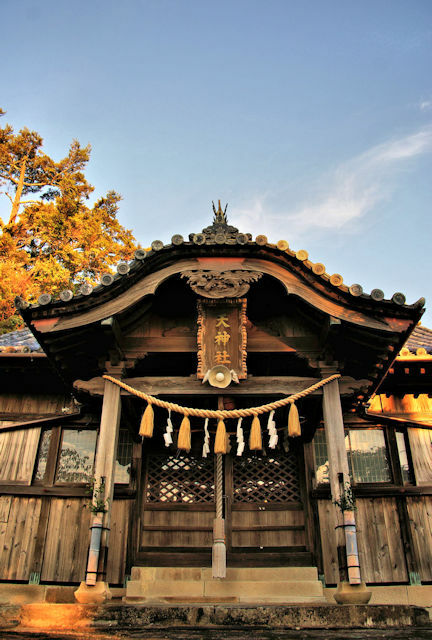 It's listed in the Engi Shiki, a tenth Century document that, amongst other things, lists all the shrines in Japan that were receiving official offerings from the central government in Kyoto. The shrine also has some interesting kami enshrined here. The main kami is Haniyasuhime, the female of the pair of kami known as kami of the soil. 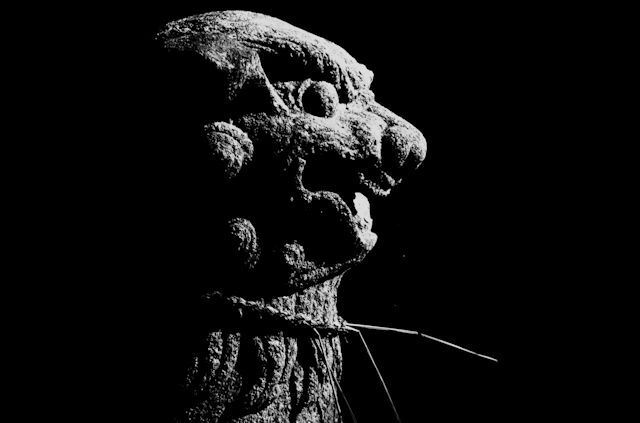 According to one version of the myth the two kami were created out of the feces of Izanami after she was killed by the kami of fire. The agricultural reference is pretty obvious. 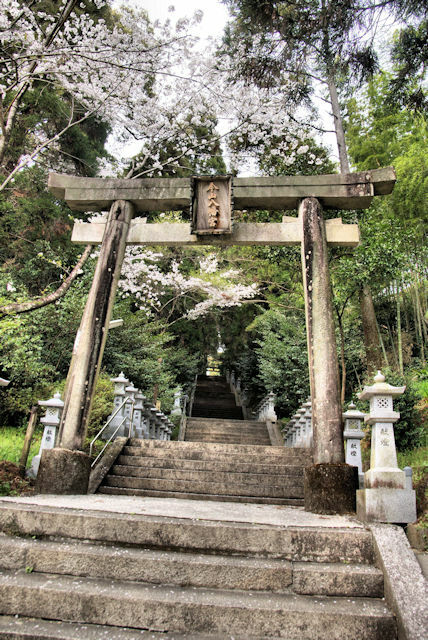 Another couple of female kami are enshrined here also, Oyatsuhime and Tsumatsuhime, both daughters of Susano who arrived near here from the Korean Peninsula along with a Susano son, Isotakeru. All three landed not far from here near the village named after Isotakeru, Isotake. The three kami are known for spreading the seeds of useful trees they brought with them. 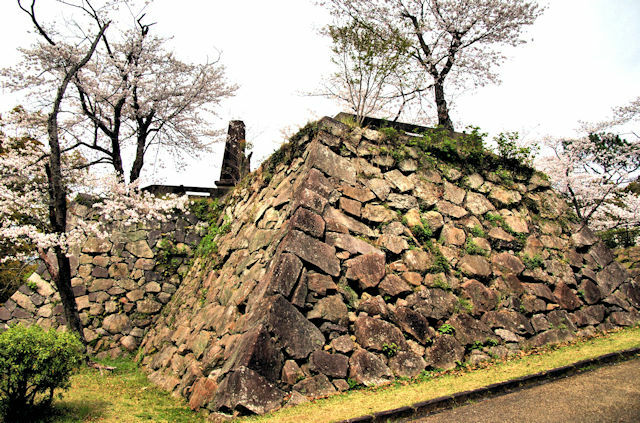 Origunally called Agata Castle, Nobeoka castle was never very big and didn't even have a keep, ony a three-story turret that only lasted 30 years before burning down. 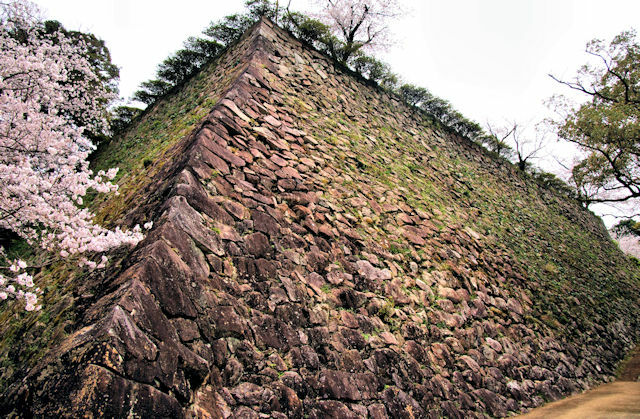 Built on a small hill at the junction of two rivers, a succession of clans controlled the castle with the Naito holding it until the castle was decommissioned in 1870. There are no buildings left but the gate was rebuilt in 1993. 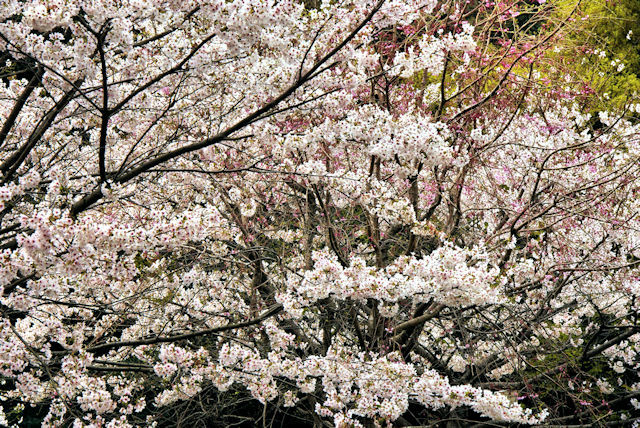 Like most castle ruins the grounds are now planted in cherry trees. 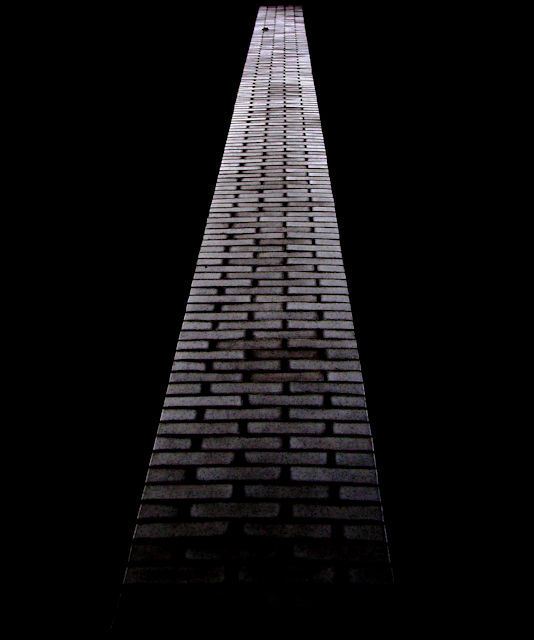 a more than twenty meter high wall supposedly would collapse and crush 1,000 attackers should a single keystone be removed. 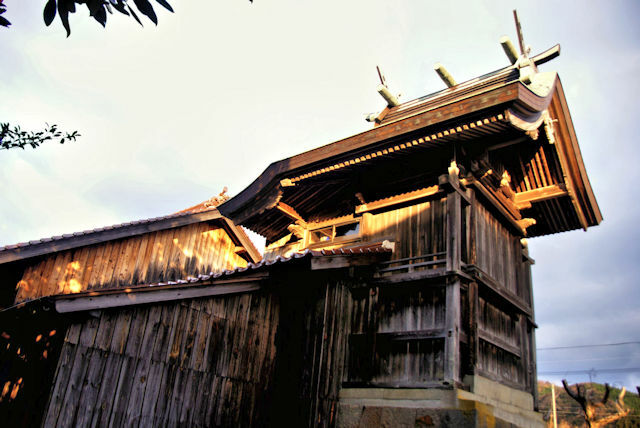 Saigo held the castle briefly in 1870. 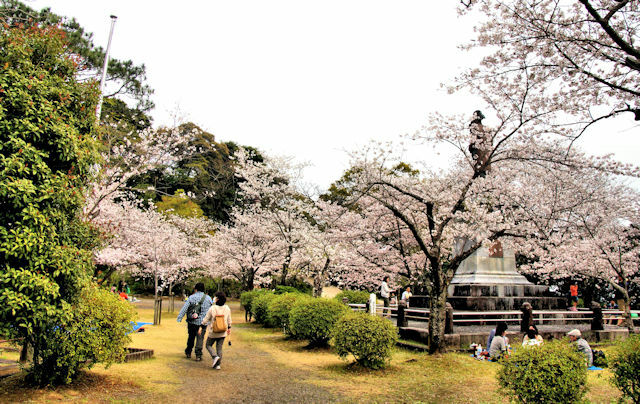 Now it is a popular ohanami spot. 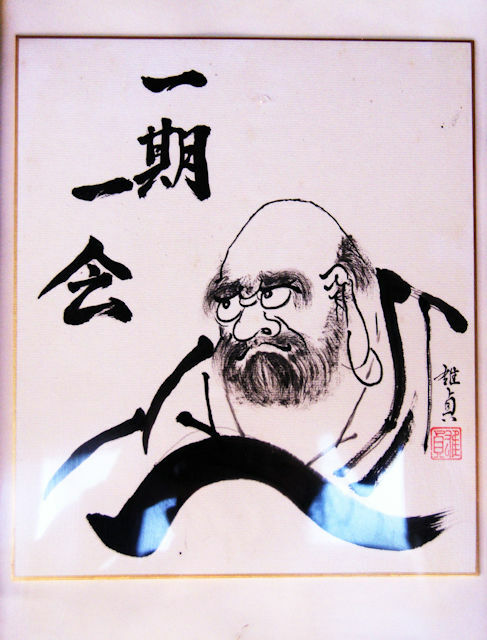 Daruma is the Japanese name for Bodhidharma, a legendary figure who is credited with transmitting Zen teachings from either India or Central Asia to China. 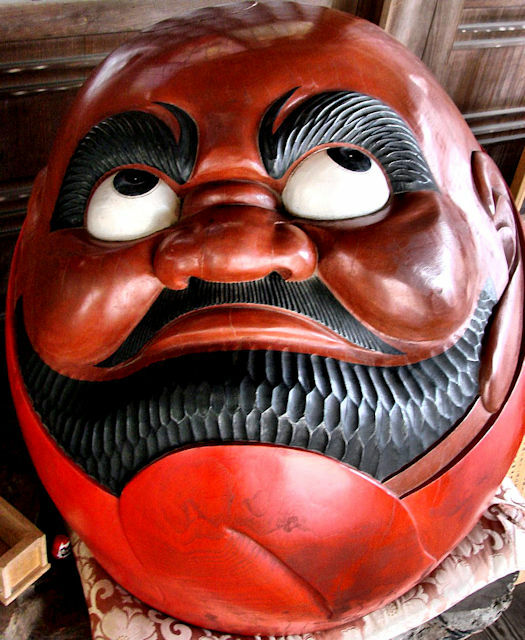 In Japan he is nowadays most commoly associated with the Daruma Doll, a small figure one uses in making wishes. He has no arms or legs as they "fell off" after years of sedentary meditation. 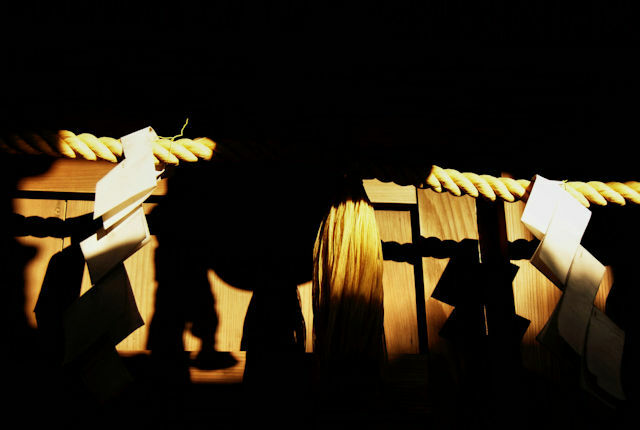 Small dolls are the form of Daruma one most encounters in Japan. The top photo however is I believe a wooden "fish drum". 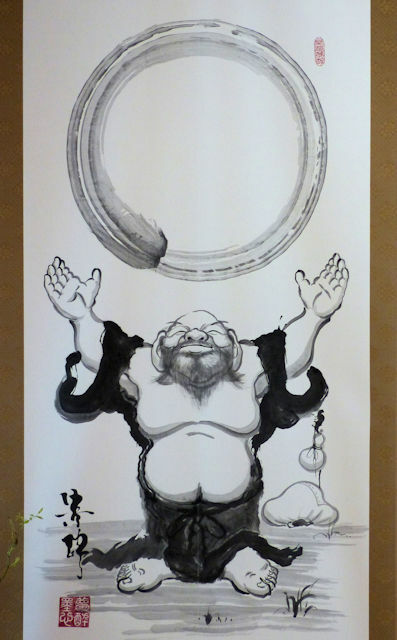 The second photo is a painting of Daruma. 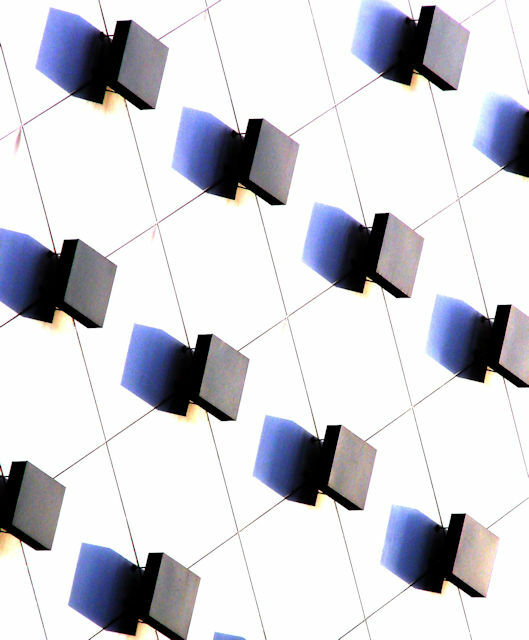 These are found usually at Zen temples. 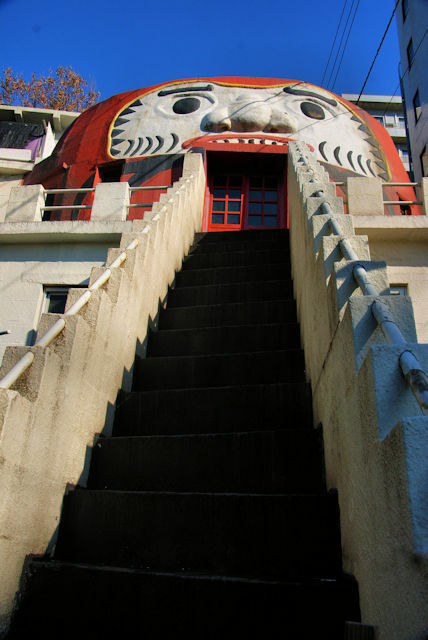 In Matsuyama I found this small Buddhist "chapel" in the shape of Daruma. 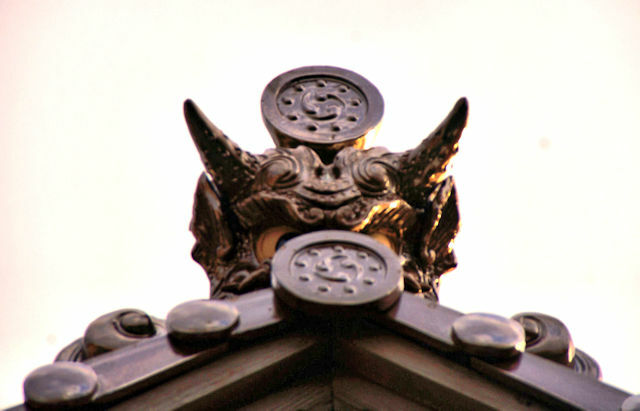 The next photo is also from a Zen temple. 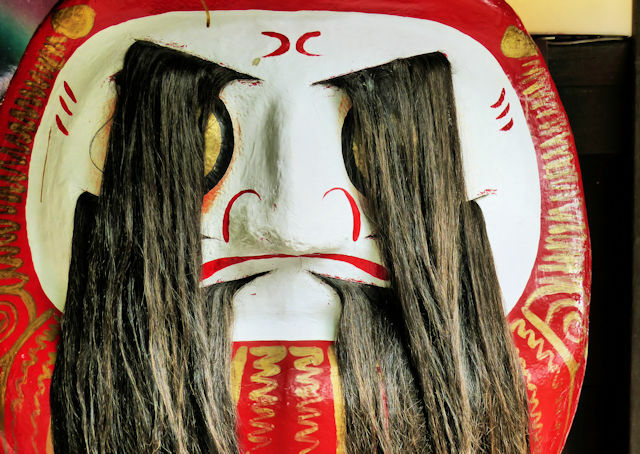 I'm sure there is a story behind the very long eyebrows and facial hair of this large Daruma doll found near Arashiyama. After leaving the Saigo Takamori Memorial Museum, I still had a couple of hours walk to get into downtown Nobeoka and the pilgrimage temples to visit. 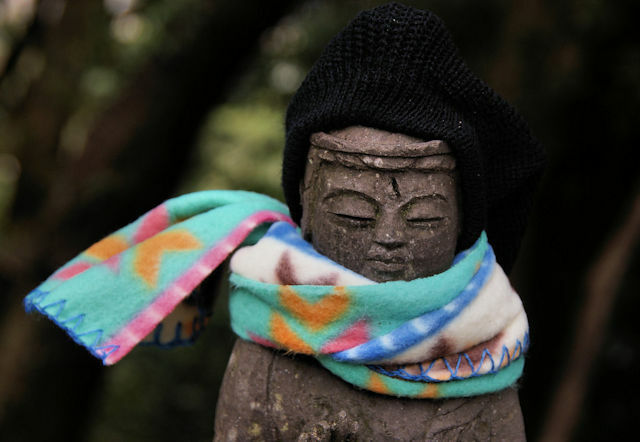 Along all roadsides in Japan you will find statues of Jizo, often well protected against inclement weather. 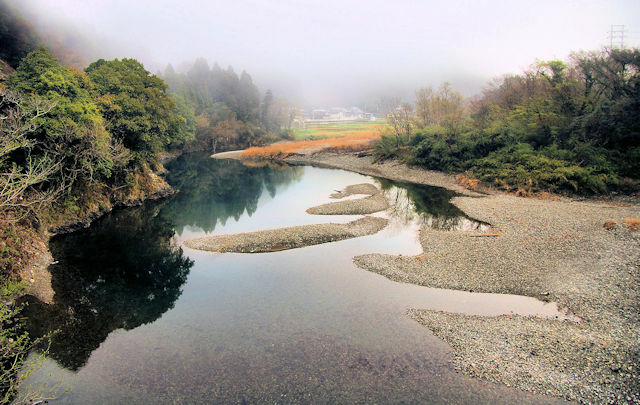 After leaving Saba Daishi I headed off down the coast on my 11th day of walking along the Shikoku Pilgrimage. By the afternoon I will have crossed over into Kochi Prefecture. I stopped in at every shrine I passed, as is my habit. 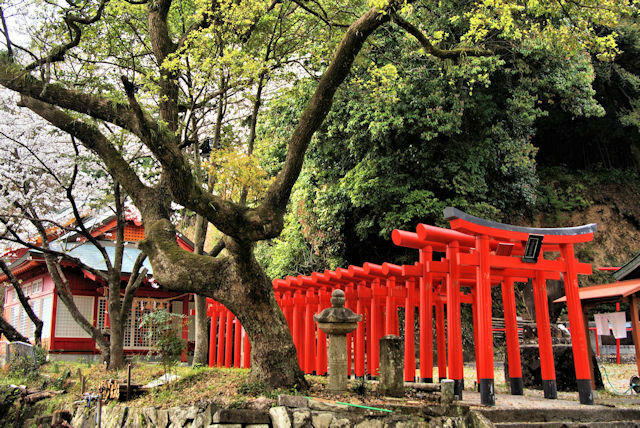 Shrines are great spots to take a rest in the shade. 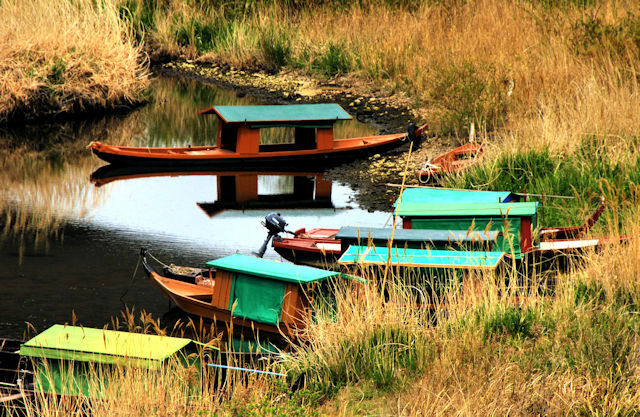 Even in urban areas they are quiet and peaceful. 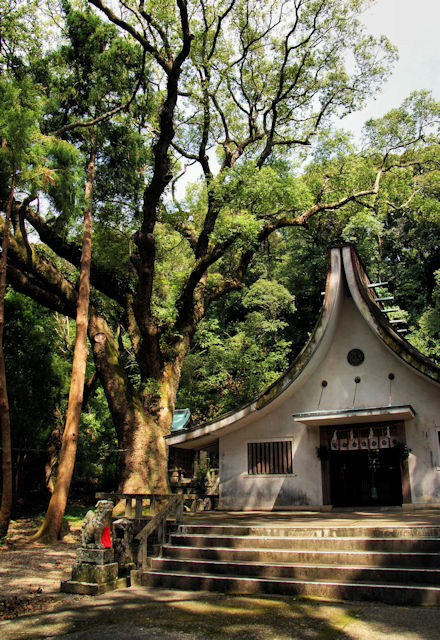 The architecture can be interesting and I'm always searching for stories and legends, and it is at shrines are where you can find signs of them. 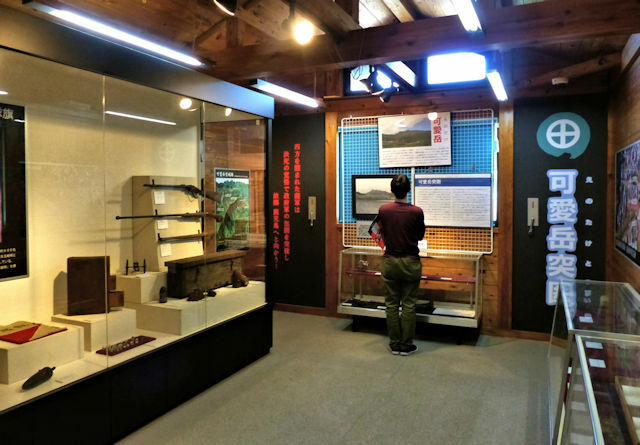 On the banks of the Kitagawa River north of Nobeoka in Miyazaki is the Saigo Takamori Memorila Museum. 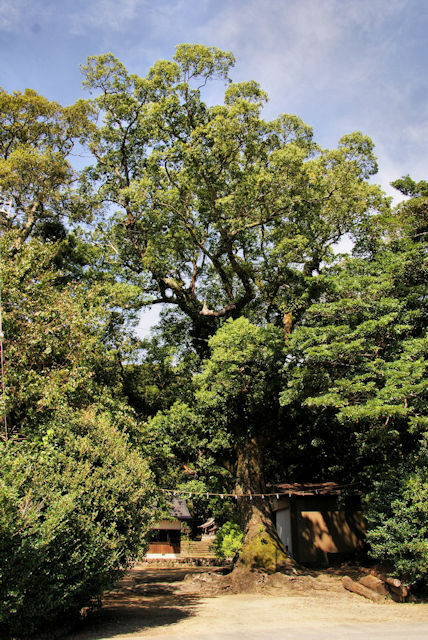 On this site Saigo nade a temporary headquarters following the disasterous battle of Wadagoe in the mountains nearby. Now reduced to probably only 3,000 men, and having lost all his artillery, Saigo declared the war over and ordered his army to surrender. 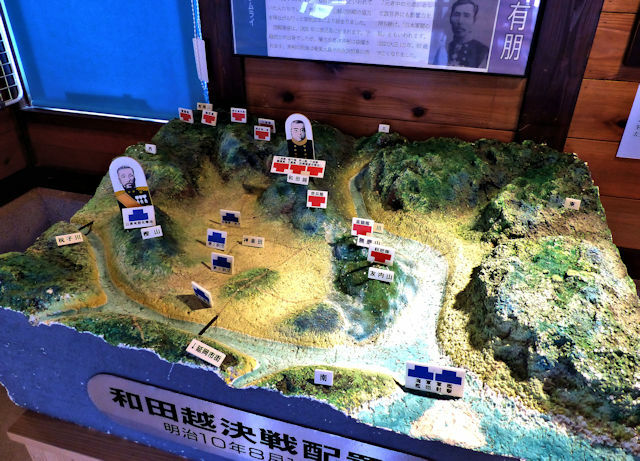 With a few hundred of his most loyal followers he somehow managed to escape over the mountains and headed back towards Kagoshima and his suicidal last stand against the government forces. 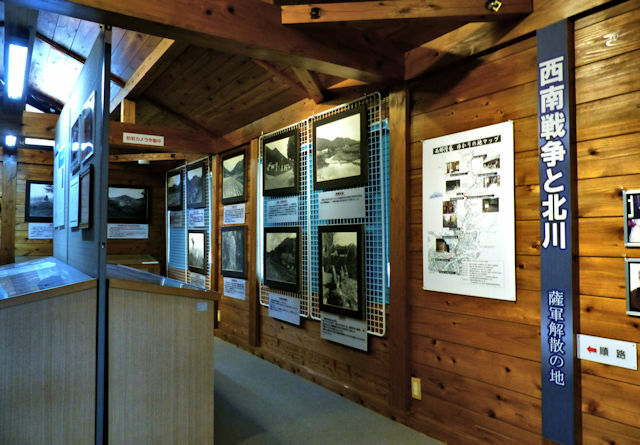 The small museum has recently been renovated and improved, and the admission fee removed. 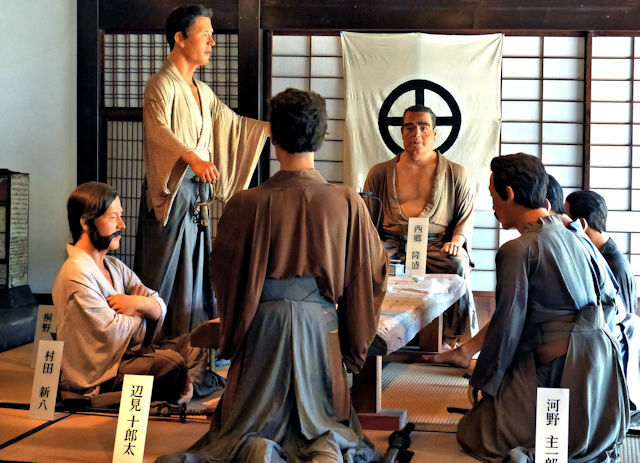 There are quite a few materials on the battle, artifacts from the war, a replica of the uniform Saigo burned here, and the centrepiece is a tableau featuring Saigo and his men. 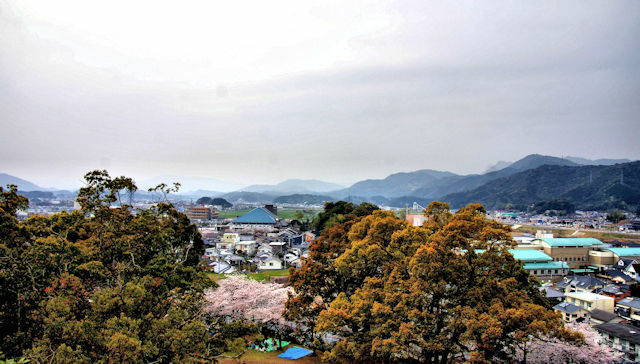 Just a few hundred meters away , and also recently renovated, is a small park containing what is claimed to be the burial mound of Ninigi, sent to Japan to rule on behalf of Amaterasu the sun goddess. 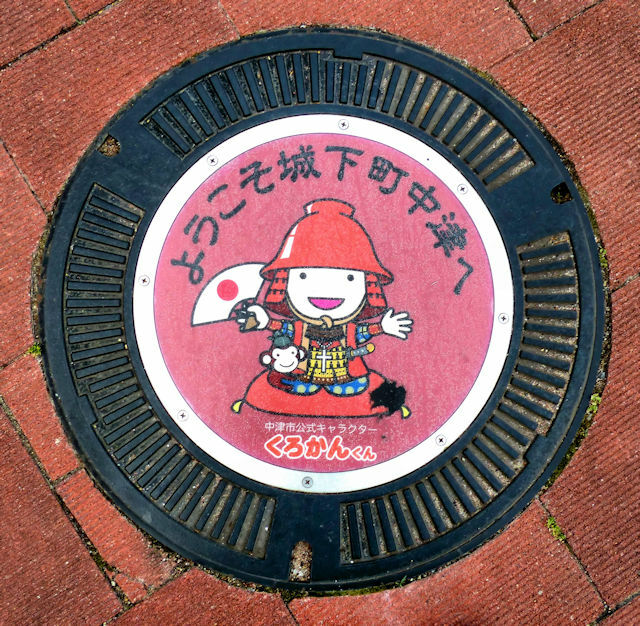 There are more "cute" mascots per capita in Japan than anywhere else on the world by far. Last year a serious culling took place but still they continue to propagate. 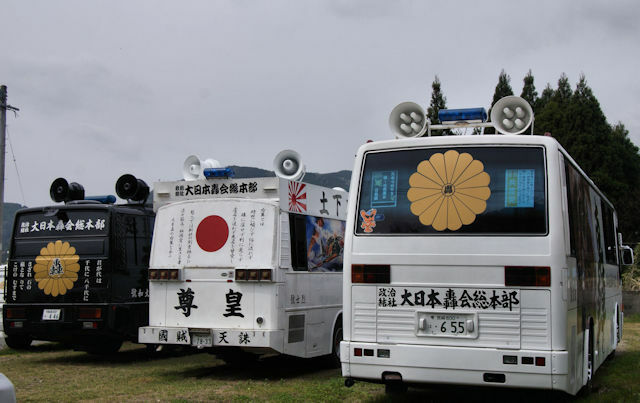 Among the latest is even one for the campaign to "promote" the cleanup of the nuclear meltdown at Fukushima. To my mind such infantile mascots belong in the realm of the under 7's, but I seem to be in a minority. 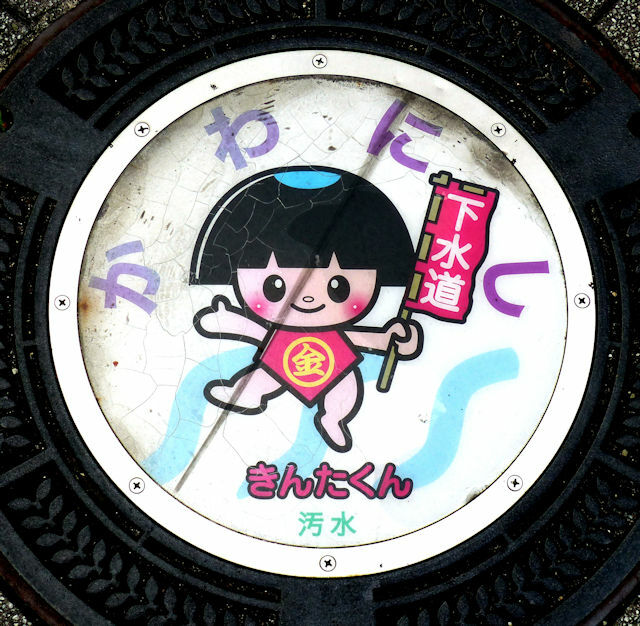 Its not surprising then that such mascots appear sometimes on the manhole and drain covers. 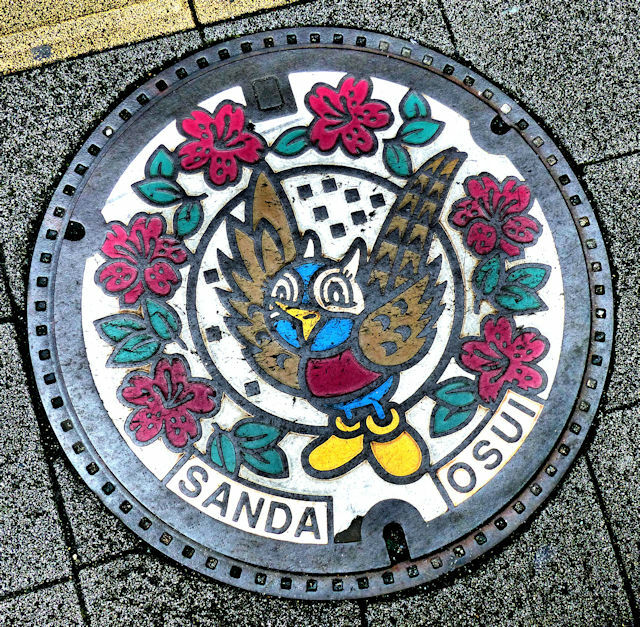 The first is of one of the pair (male and female) of mascots for Sanda City in Hyogo. I believe it is based on the official city bird, the green pheasant. 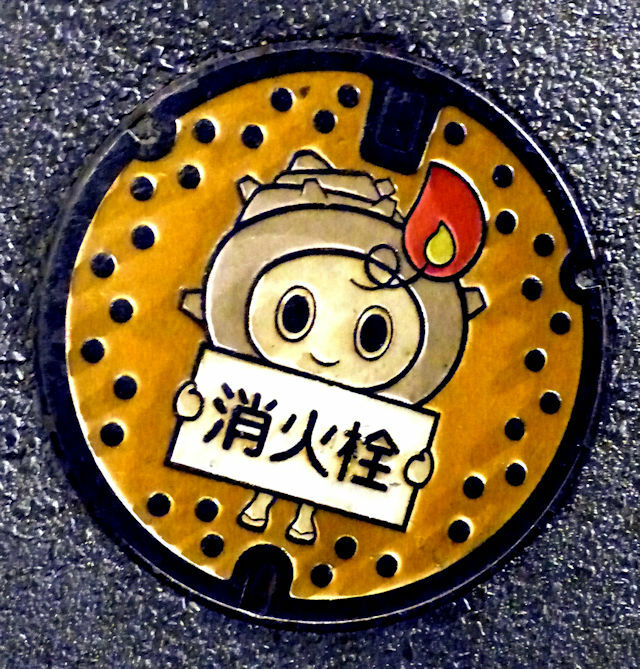 The second depicts Ratochan, the official mascot of Oda City where Iwami Ginzan is located. It is based on the shell-candle miners used to take to light their work underground. The third is from Nakatsu. 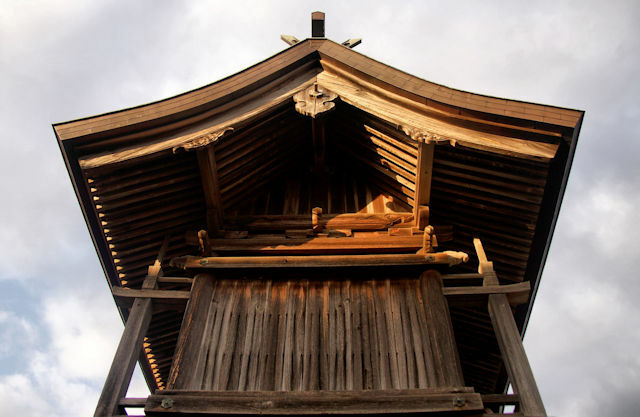 Kurokankun is based on Kuroda Kanbe, the samurai who built Nakatsu castle. 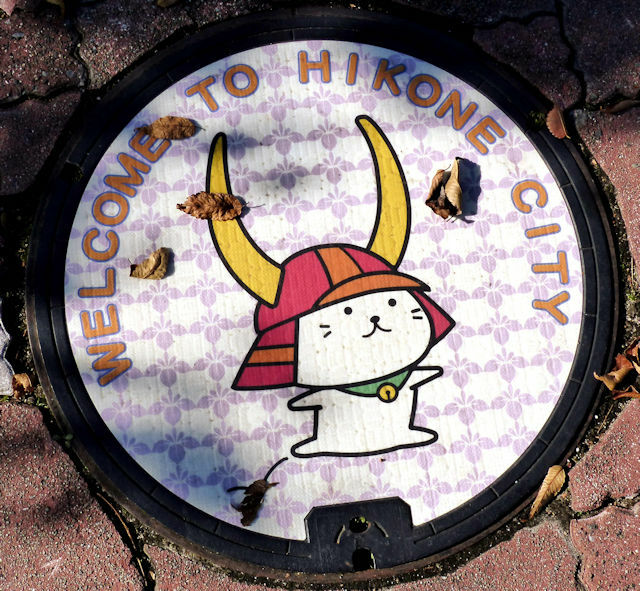 The fourth is Kintakun, the mascot of Kawanishi in Hyogo, and the final one is I think a cat in samurai helmet representing Hikone. 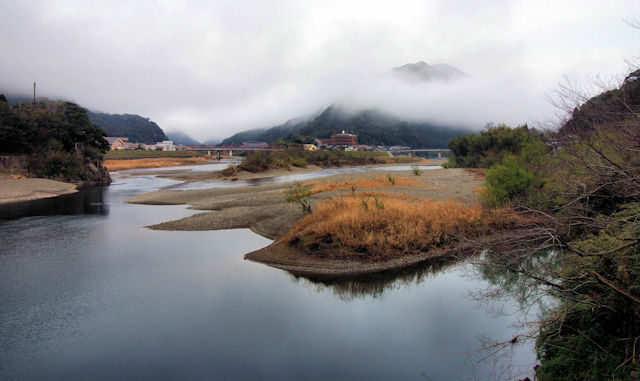 I started my 18th day along the Kyushu Pilgrimage just across the border into Miyazaki. I started to follow one of the branches of the Kitagawa River as it flowed downhill towards Nobeoka. 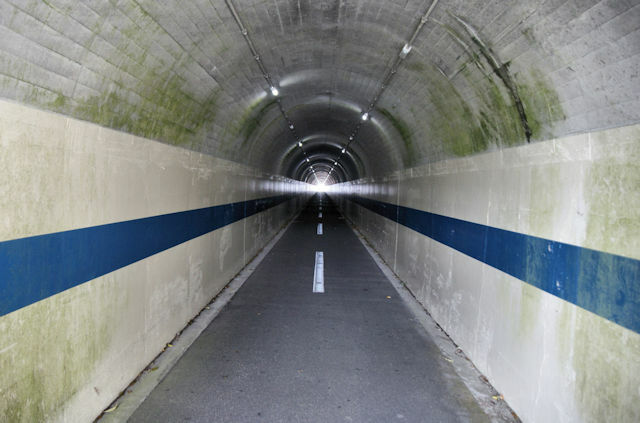 Walking long distances in japan means either walking the coastline which is relatively flat, or following a river up to a pass and then down the other side...... the path of least climbing. 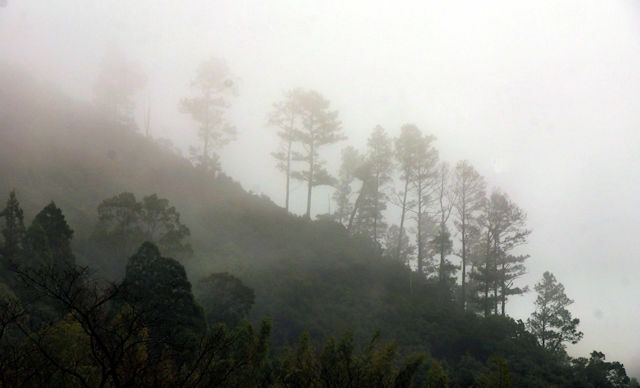 For much of the year mist clings to the mountainsides and fills river valleys, and today was no exception. 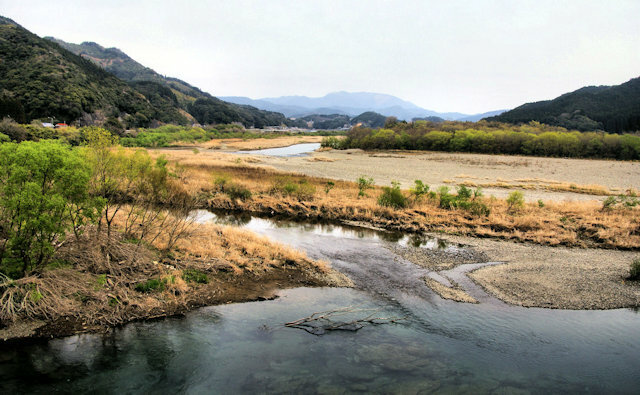 There are probably dozens of Kitagawa Rivers in Japan..... the name simple means North River. Most family names in Japan are derived from locations, so Kitagawa is a fairly common family name..... the most famous that springs to my mind being Kitagawa Utamaro, the famous Edo Period artist. 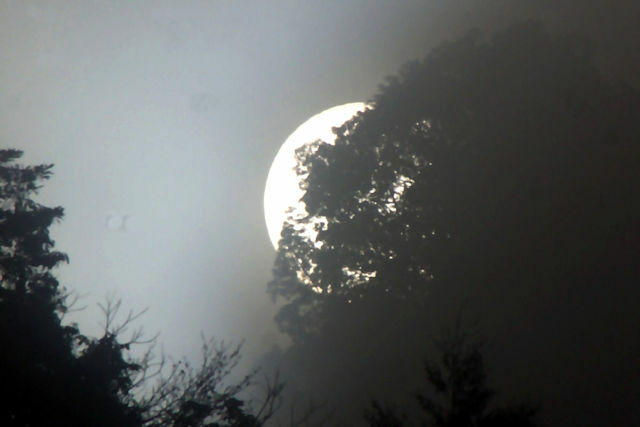 The mist was at times so thick the sun became white. By lunchtime I was down much closer to sea level, the mist had long since burned off, I pass where a larger branch of the river joined up, and traffic had increased. The first time I visited Hakata I woke at 5 in the morning, and seeing as how the hotels breakfast didnt start until 7 I took my camera and went out to explore. 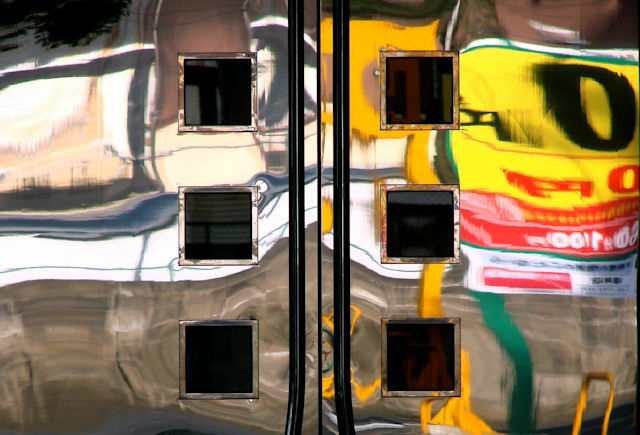 Modern architecture is a gold mine for the kind of photography I like,... geometric, abstract, patterns, reflections, light and shadow...... None of the buildings were famous or by famous architects, just office buildings, hotels etc. 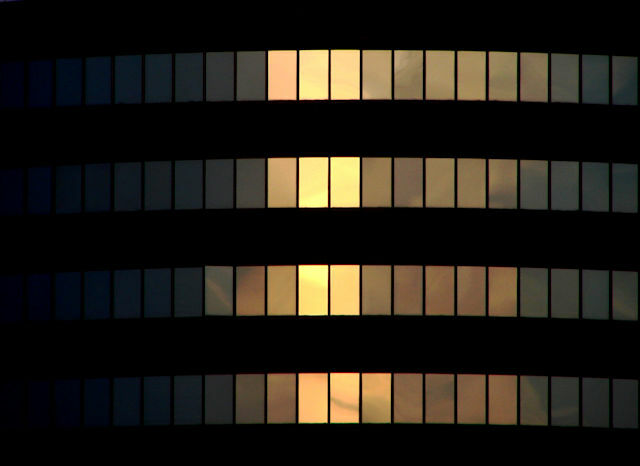 Sunrise is the optimum time for photography with the light and color and shadows being at their strongest. I quite happily snapped away and took more than 100 shots before breakfast.